Letting our children enjoy certain activities that will have an impact on their learning process is one of the best things we can do for them, even more so if through that experience they can learn more about the environment that they are part of. Find out how to make a swimming with dolphins adventure a perfect moment for your child. If, as a parent, you’re not sure whether swimming with dolphins is the ideal activity for your child, maybe the information below about how to live this experience will be useful to make the right decision. What’s the ideal age for a kid to experience swimming with dolphins? All children, no matter their age, can live this incredible experience. However, if your children are less than 8 years old, they will have to be accompanied by either yourself or an adult who can prove they are the legal tutor or have your authorization. Children over the age of 8 can swim with dolphins on their own, if they wish to. It doesn’t matter if your children can’t swim, they can also live the experience! Everyone who decides to swim with dolphins has to wear a lifejacket, for their own safety and that of others, regardless of whether or not they know how to swim. The best thing is that there are lifejackets adapted to each person’s size, even for children. What can a child do during a swimming with dolphins experience? Besides learning about one of the ocean’s most intelligent mammals at first hand, children can take part in many different activities such as communicating with dolphins through signs, clap, dance with them, hug them, kiss them and so much more. To complete the children’s experience, it would be better if, before swimming with dolphins, they learnt something about this specie, its main characteristics, feeding habits, social behaviors and most of all, its importance in the balance of the marine ecosystem. This is the only way your children will understand the role that each living being on the planet plays in the environment’s life cycle. Let them live a unique experience that they will then want to share with everyone they know and that they will remember forever. Do you want to know more about the dolphin kids swim? 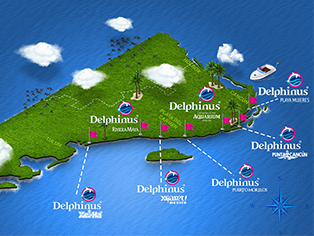 Discover the Delphinus Kids experience!